Marc's current exhibition The Toxic Sublime opened on 14 July. It runs until 13 September 2015. 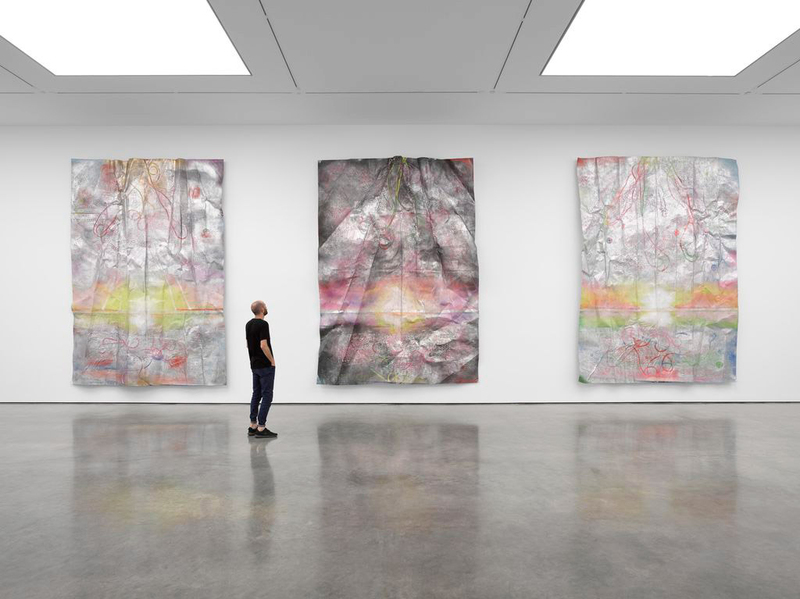 White Cube is pleased to present an exhibition of new work by Marc Quinn. This exhibition, Quinn’s first at White Cube London since 2010, includes two new bodies of work and is the culmination of two years of investigation into natural phenomena and our distanced and complex relationship with the environment. The Toxic Sublime series are distorted, three-dimensional seascapes that blur the boundaries between painting and sculpture. They begin with an inherently contradictory artistic gesture whereby Quinn submits a photograph on canvas of a sunrise to a process of aggressive alteration. The photograph is first sanded and taped, then spray-painted through various templates comprising flotsam and jetsam gathered from the beach. Once this process is complete, the artist takes the canvas out onto London streets and introduces the impressions of drain covers into the surface of the work. This intrusion is suggestive of how water, which is free and boundless in the ocean, is tamed, controlled and directed by the manmade network of conduits running beneath the surface of the city.